Ashley Coffey's first-half treble helped Whitby Town return to winning ways with a 6-1 hammering of lowly North Ferriby United. Ashley Coffey opened the scoring from a great Leon Scott through-ball on 15 minutes. Coffey then doubled his tally on 37 minutes, tapping into an empty net after a great run and shot from Greg Rutherford. The latter then fired in a third from the spot in the 42nd minute, after a foul on Coffey. 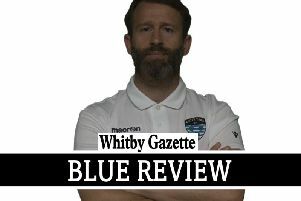 Whitby made it 4-0 at half-time, Coffey completing a first-half hat-trick with a cracking low shot from the edge of the area. Callum Patton got in on the scoring act in the 57th minute, waltzing past the entire Ferriby defence before slotting home. Dale Hopson then added a sixth goal as the Blues continued to run riot against the struggling visitors. Leigh Hutchinson pulled a goal back for Ferriby two minutes from full-time.